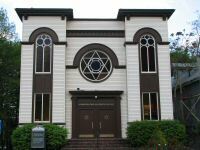 Congregation Agudath Achim in Taunton, MA, serving Taunton and surrounding communities, cordially invites you to join us on Saturday morning, November 3, 2018, at 12:00 noon for a Sabbath of Peace Memorial Gathering in Memory of Our Jewish Brothers and Sisters Murdered at Tree of Life Synagogue in Pittsburgh last Saturday. All who come in peace are welcome. We will meet at our synagogue, located at 36 Winthrop Street (Route 44) in Taunton, just west of Taunton Green. Parking is available on the street, across the street on the Winthrop Street Baptist Church lot which they graciously share with us on an ongoing basis, and at our Jewish Community House at 133 High Street. There is also City of Taunton public parking on lots in various downtown locations. The first part of our gathering will be a traditional Jewish service (in both Hebrew and English) as conducted in a “House of Mourning”. Following this service, selected religious and civic leaders will have an opportunity to offer brief statements of condolence, peace and hope. We plan to keep the entire occasion to under an hour. At the conclusion there will be time set aside for photographs, but not during the service and remarks themselves. Please note that our 105-year old synagogue building is not yet handicapped accessible. There are about half a dozen stairs into the building through the front doors. These front doors and the interior doors to the sanctuary on the main floor are wide enough to accommodate wheelchairs, but that person would need to be carried into the building and would have no access to the restrooms, which are located downstairs. We also have a balcony, upstairs, overlooking the main sanctuary. We apologize in advance for this bar to anyone’s participation. It is our custom for men to wear a head covering/yarmulke/kippah, though not an absolute requirement. These are available when you enter the synagogue. Our worship service attire preference is “business casual” at a minimum. We do, however, count on your own good judgment and aim to welcome everyone. We will be posting this notice on our website www.jewishtaunton.com and on our Facebook page, A Family of Friends at Congregation Agudath Achim in Taunton and distributing to organizations and news outlets. Please feel free to share this information as you see fit.